Arrayit Corporation and BioDiscovery collaborate to provide ImaGene® 9.0 Microarray Quantification and Analysis Software as an advanced and comprehensive solution for microarray image quantification quantification and analysis applications including gene expression, SNP analysis, genotyping, whole genome analysis, tiling, re-sequencing, and many other applications in DNA and RNA microarrays. 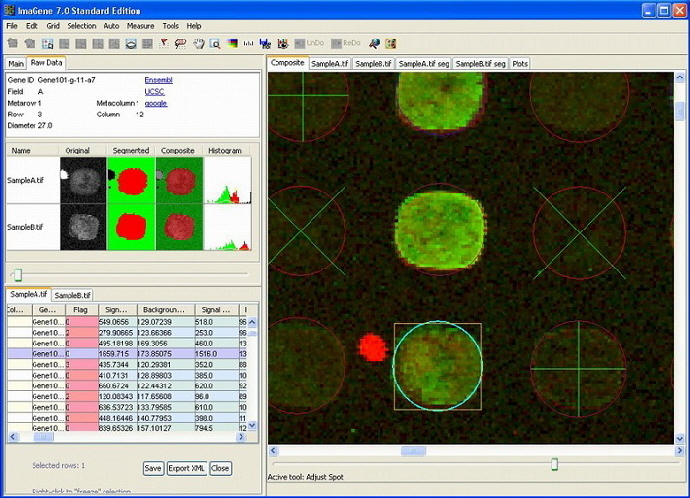 ImaGene® 9.0 offer broadly used, highly refined features including roprietary machine vision technology to deliver the highest quality data and most powerful automation to quantify, normalize and analyze all types of microarray experiments and platforms. Patented superior spot finding technology and segmentation and contamination removal algorithm ensure optimal performance. Cost is per software seat.